Fully loosen the jam nuts (1) and (2) and mount the throttle cable housing to the frame. Make sure the throttle pedal is against the rear pedal stop (3). Pull the throttle cable housing toward the rear of the kart until you feel resistance. Warning: DO NOT pull the throttle cable housing any further. Hold the cable housing in this position and screw the front jam nut (2) against the frame. Warning: Pulling the throttle cable housing past the first point of resistance will engage the engine throttle while the throttle pedal is in the idle position. Upon starting the engine, the vehicle may accelerate. Screw the rear jam nut (1) against the frame. Tighten the front jam nut (2) securely. 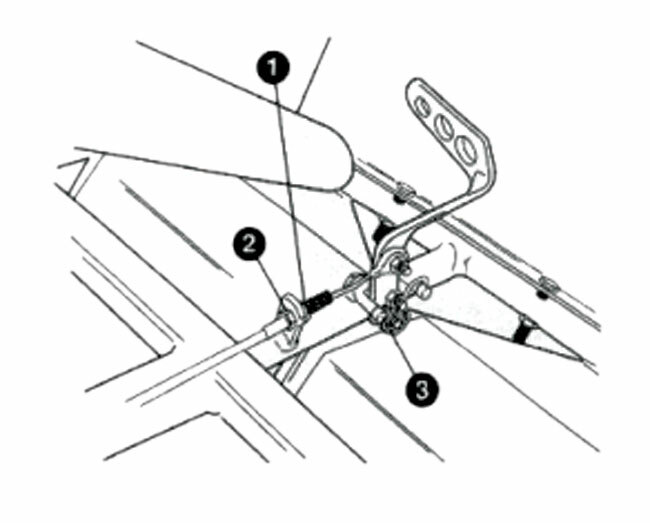 Make sure the engine throttle linkage is in the idle position and the throttle pedal is against the rear stop. Block the rear end of the kart up off the ground and start the engine. If the engine is not at idle speed, stop the engine and repeat the above procedures. Warning: The engine must be at idle speed when the throttle pedal is in the rear position. Failure to adjust the throttle properly may result in personal injury and/or vehicle damage. If you are unable to properly adjust the throttle, contact a dealer for assistance. Make sure exposed end of the throttle cable does not interfere with throttle mechanism or cable end does not come in contact with engine ground terminal.